Picked this beer up at the Hunger Mountain Coop in Montpelier VT on one of my trips to Vermont. 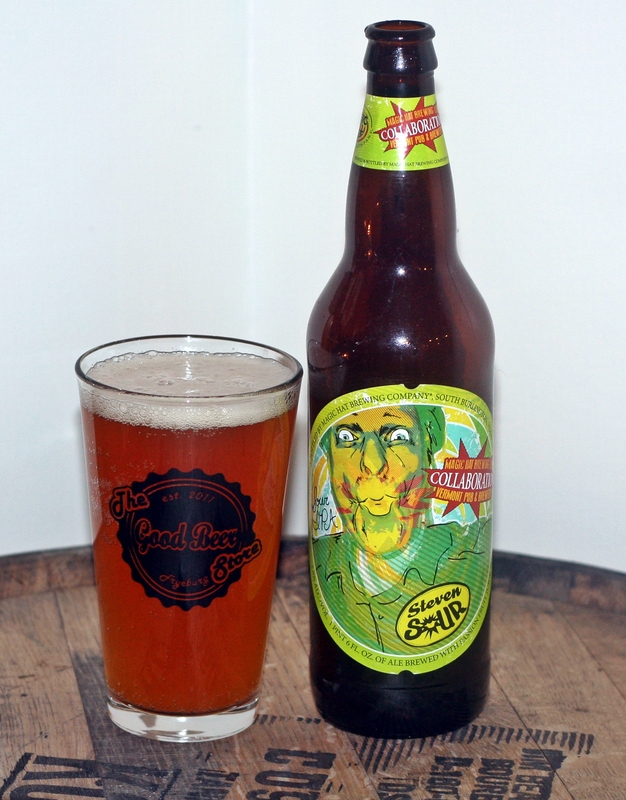 I usually wouldn’t buy a Magic Hat beer but this was a collaboration with Vermont Pub & Brewery and it was cheap. I believe the bomber was $3.89. Also the thought of a sour IPA was intriguing. When I think sour beer I think acidic beer with a mouth puckering tartness but this beer was actually brewed using passion fruit juice to give it a lemonhead sour candy taste. Appearance is pretty typical for an IPA with a nice orange color and thin off white head. Aroma has plenty of sour fruit, usually the fruit smells would come from the hops but in this case it actually comes from the passion fruit juice. Taste is interesting but dominated by the tart passion fruit juice and only a slight bitterness. Overall this was not a bad beer but not something I will purchase again. Brewers Description: This sour, bitter, tantalizingly tart ale is brewed with Apollo, Bravo and Cascade hops along with a healthy addition of passion fruit juice. The result is 85 IBUs of Sour IPA, beautifully balanced with a big hop bite battling for supremacy against a tart passion fruit tingle.